Looking for some warm and summery butterfly wedding invitations? Welcome to the butterfly garden! 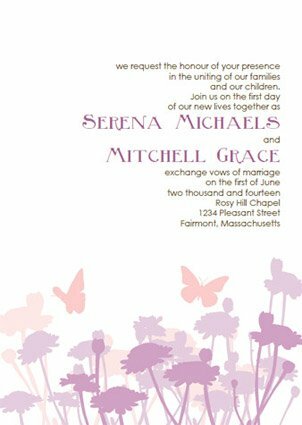 I have received so many requests for butterfly invitations, and have been so inspired by the warm summery breezes of summer, the butterflies frolicking in my gardens. I just had to create a series of butterfly garden templates! 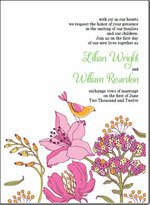 These invitations will pair nicely with any spring or summer wedding. Dress them up with a crisp or shimmery pocketfold or backing cardstock, ribbons or shimmer mist sparkles. But these invites are pretty enough to stand alone on some simple crisp white cradstock. 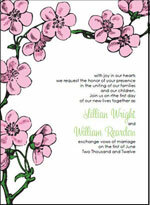 I've created these invitations in three different color palette combinations. A pretty peach and lavendar perfect for a beautiful spring or beachy summertime wedding, a bright and breezy pink and yellow template reminding me of bright sunny days, and a cool lavendar and turquoise kit for a gorgeous summer evening ceremony. Our kits can be purchased a s full kit with all of the fixin's from Save the Dates and rsvp's, to place cards, table numbers, and more. But you also have the option to purchase ala' carte to keep it simple and affordable with just the items you wish to use the most. All kits have a free sample to check out and print to see if our DIY kits are right for you. 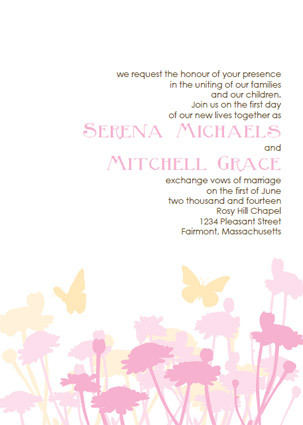 Our interactive invitation templates are designed for easy home use. Just change the fonts and wording to your specifications, and print them on your home computer printer. Each template piece has it's own handy cutting guidelines for easy paper trimming.